Array objects give special treatment to a certain class of property names. A property name P (in the form of a String value) is an array index if and only if ToString(ToUint32(P)) is equal to P and ToUint32(P) is not equal to 2^32-1. A property whose property name is an array index is also called an element. Every Array object has a length property whose value is always a nonnegative integer less than 2^32. The value of the length property is numerically greater than the name of every property whose name is an array index; whenever a property of an Array object is created or changed, other properties are adjusted as necessary to maintain this invariant. Specifically, whenever a property is added whose name is an array index, the length property is changed, if necessary, to be one more than the numeric value of that array index; and whenever the length property is changed, every property whose name is an array index whose value is not smaller than the new length is automatically deleted. This constraint applies only to own properties of an Array object and is unaffected by length or array index properties that may be inherited from its prototypes. 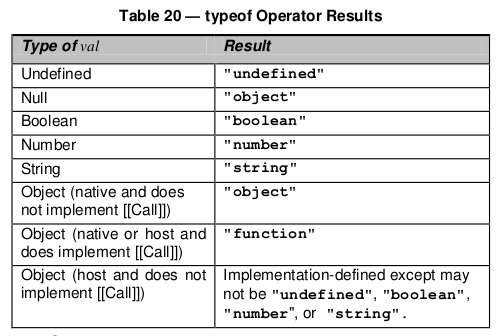 Primitive Data types - This includes null, undefined, string, boolean, number and object. Length - This can be 0 or above (non-negative). The array indices. By this, I mean "0", "1", "2", etc are all properties of array object. Hope this helped shed more light on why typeof Array returns an object. Cheers! Keep in mind that a.length will be undefined, because length is treated as a key, you should use Object.keys(a).length to get the length of an Associative Array. Why does console.log() show an array, but typeof returns 'object'? NodeJS: Array automatically gets converted into object? Why does the console displays typeof as object for an array?